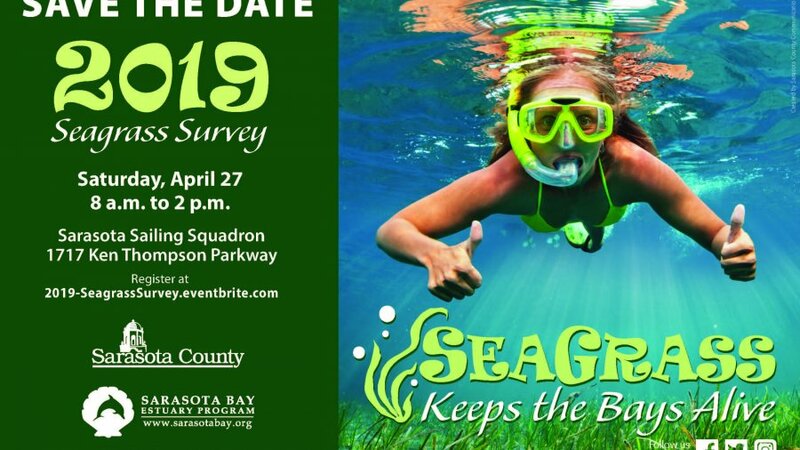 DESCRIPTION: Hosted by Sarasota County and Sarasota Bay Estuary Program, the Seagrass Survey is a FREE, citizen-science event that encourages community members to explore the beautiful and mysterious seagrass habitats while increasing awareness of the economic, environmental, and aesthetic value of seagrass ecosystems in Sarasota Bay. We need volunteers to take to the waters in Sarasota Bay to survey seagrass habitats and collect data which contributes to Sarasota County’s Seagrass Monitoring Program. The information collected will aid in Sarasota County’s understanding of the health and productivity of our estuary. The Seagrass Survey is open to the public, with boaters, kayakers & paddleboarders, and snorkelers encouraged to participate. Seagrass Survey Volunteers will receive a free t-shirt and lunch for participating. Survey participants must register at 2019-SeagrasSurvey.eventbrite.com. Registration is limited to 150 spots and is first come first serve. Following the Seagrass Survey, stay for a nature festival back on land. This FREE, family-friendly festival It will feature educational exhibits, hands-on activities, music, food, and more. Wading trips to explore the creatures that live in the seagrass flats will be available for registration. On the trip, participants could find small fish, crabs, sea stars, urchins, and many more species! PARKING: Free public parking is available at Ken Thompson Park (1700 Ken Thompson Parkway), across from the entrance to the Sarasota Sailing Squadron. The Seagrass Survey event coordinator, Sheila Scolaro, can be contacted directly by phone at 941-861-0635 or by email at sscolaro@scgov.net.